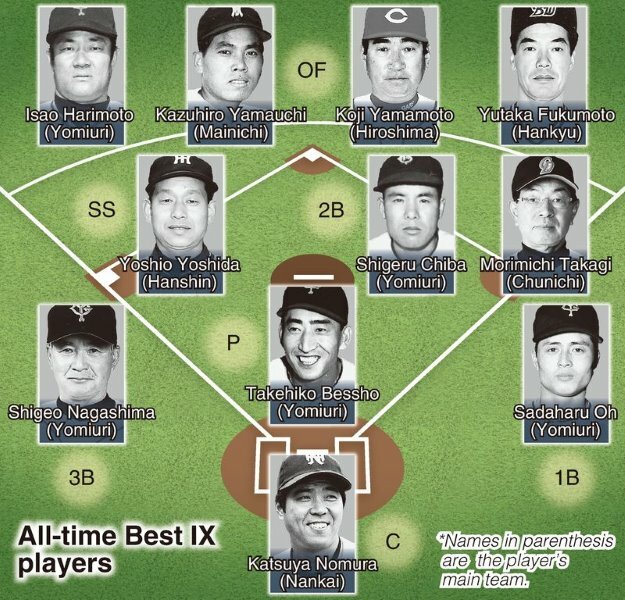 As part of the 80th anniversary of Nippon Pro Baseball, the league on Wednesday announced its “Dream Team” of the all-time Best IX winners at the NPB Awards ceremony in Tokyo. Leading the way was 19-time Best IX selection Katsuya Nomura, followed by superstars including Sadaharu Oh, Shigeo Nagashima and Isao Harimoto. Harimoto also had some sharp words for current NPB award-winning players. Former Hanshin shortstop Yoshio Yoshida said he expects more from Japan’s top players. Nagashima, 78, a lifetime honorary manager of the Yomiuri Giants, was a 17-time Best IX player at third base for the Giants, while 74-year-old Oh, the Fukuoka SoftBank Hawks chairman and 18-time selection at first base, was among those who were named among the best in NPB history. “I’m honored,” said Nagashima, who pointed to the 1959 game in front of the Emperor and Empress as the instance that most stood out in his memory. Oh pointed to the pioneers of the game for making it popular.